This document defines platform and language neutral programming interfaces that provide Web applications access to a hierarchy of dynamic properties representing device capabilities, configurations, user preferences and environmental conditions. This is a W3C Candidate Recommendation of the Delivery Context: Client Interfaces (DCCI) 1.0 Accessing Static and Dynamic Properties specification, for review by W3C members and other interested parties. Two interoperable implementations of all the features, both mandatory and optional, of the specifications have been produced. The Working Group releases a test suite along with an implementation report. The test suite is currently under development, and will be released along with a call for implementations for this specification. This specification will remain a Candidate Recommendation at least until 30 June 2008. The DCCIPropertyFilter Interface (including the dcciPropertyFilter argument to searchProperty() ) is considered at-risk by the Working Group. In the absence of 2 interoperable implementations, the feature would be dropped from the specification when moving to PR. The Working Group believes that removal of this feature will not substantively change the specification. The changes that this version introduces from the third Last Call Working Draft are only editorial in nature: each change is either a clarification of the previous text or a correction of a typographical error. Those changes are result of the feedback received on the public mailing list. This feedback as well as the resulting modifications are compiled in the Disposition of Comments document. Please send comments to public-dcci-editors@w3.org. This list is archived at http://lists.w3.org/Archives/Public/public-dcci-editors/. The group's record of the comments received during the Last Call period and their disposition is available. This document is published as part of the W3C Ubiquitous Web Applications Activity by the Ubiquitous Web Applications Working Group. It is a deliverable as defined in the Charter of that group. An ever increasing variety of devices with an increasing range of capabilities is gaining the ability to access the Web. This is providing the opportunity for the development of novel applications that are sensitive to such capabilities and can make use of them. Devices often keep a significant amount of information about their current operating state. Information, such as the current battery level, the ambient light level of the surroundings, the bandwidth available on the currently connected network and whether or not the user has muted audio output, is often available. The normal mechanism for accessing such information is via system-specific interfaces provided within the device. The interface described in this specification provides a more general mechanism that allows this kind of information to be made available to scripts running in Web pages within a browser on the device. Applications built using script-based techniques, such as AJAX [AJAX], have shown how dynamic capabilities can be included in Web pages. Scripts that use DCCI will also be able to use dynamic information about the device, network and user preferences to influence their behavior. Not only has the proliferation of web-capable devices increased the range of capabilities available to users and application developers, it has also increased the diversity. For example, the smallest devices tend to have smaller displays and more limited keypads than their larger counterparts. Larger devices may have touch screens or even full keyboards. Knowledge of such properties can help authors tailor the operation of the user experience and the modality to suit the device. Additional information about user preferences and the surroundings in which the device is being operated can be used to enhance the user experience further. The term delivery context[GLOSS] describes the set of characteristics of the device, the network, user preferences and any other aspects that apply to the interaction between a device and the Web. Some aspects of delivery context are static. For example, the color resolution of the display on a mobile device is fixed. Other aspects might be dynamic. Some devices have flip out covers that effectively provide a larger display when opened. Some devices can detect the orientation in which they are being used, and can rotate their output thereby changing the aspect ratio of the display. An increasing number of mobile devices can locate their position using the Global Positioning System [GPS]. Depending on the application in use, some or all of this information may be useful in tailoring the user experience[GLOSS]. Generally, properties are considered highly dynamic if their values can change during a session with a web server. Location is a good example of a property that can be highly dynamic with values being transmitted through mechanisms such as GPS notifications (see for example[LIF] ). Other properties may have values that can change, but more slowly. In particular, there are properties that are usually constant during a session. User preferences often fall into this category. This second kind of less dynamic property is often associated with some kind of fixed, default value. For example, a device may be manufactured with a particular font as default. A user can subsequently change this default font. Although the value of the characteristic has been changed and may affect the rendering of web pages, the value is unlikely to be highly dynamic. DCCI can provide access to any part of the delivery context available at the device. This includes static properties, those that change infrequently and those that are highly dynamic, such as battery level or location. The key uses for DCCI are related to adaptation[GLOSS]. One major use is in supporting devices that are capable of interaction with users in a variety of modalities[GLOSS]. For example, a device may be able to interact visually, or using voice, depending on the user's current context. The W3C Multimodal Interaction Framework [MMI] identifies the core components for multimodal systems. At its heart, lies the Interaction Manager [IM], which coordinates data and manages execution flow from various input and output modalities. DCCI can provide the Interaction Manager with dynamic access to the properties that represent the current delivery context. This can include the properties of the device and of the network and user preferences. These properties can indicate which modalities are supported and which are currently active. The DCCI can retrieve this information and, additionally, can provide a means to enable or disable particular modality functions. It also provides notifications when properties change. Such changes might occur as a result of a user action and might indicate that a user now prefers a different modality to be used. In providing mechanisms to query and update delivery context properties, and to report changes via events, DCCI directly supports the basic W3C Multimodal Interaction Requirements [MMIReqs] (MMI-G14, MMI-G15, MMI-A4). Another major use for DCCI relates to content adaptation for device independence. Materials to be used on a particular device may need to be tailored to take account of that device's particular capabilities. Layout, styling and the media associated with a web page may all need to be tailored based on the delivery context to achieve a good user experience. Where the tailoring is based on dynamic properties, it may be necessary to provide adaptation capabilities on the client. In this type of scenario, DCCI provides an interface that can be used to access the delivery context in support of highly dynamic adaptation. The normative and informative parts of this specification are identified by use of labels within various sections. Generally, everything in the specification is considered to be normative, apart from the examples. Individual conformance requirements or testable statements are identified in the DCCI specification by the use of specific key words. In particular, the key words must, must not, required, shall, shall not, should, should not, recommended, may, and optionalin this specification are to be interpreted as described in [IETF RFC 2119] . This specification provides a normative definition of the interface based on OMG IDL [IDL]. In addition, it also provides a normative ECMAScript [ECMAScript] binding. DCCI provides one particular way of accessing delivery context. It is particularly suitable for use within web clients. Other mechanisms are available for use in different circumstances. Two general mechanisms exist for delivery context access. One is based on the specification of programming interfaces. The other is based on specific representations of the delivery context. Interfaces provide a way to access delivery context information regardless of the way that information is actually stored and represented. This can be important for use on clients, particularly when implementations may have to execute on devices with restricted memory, processing power and battery life. Interfaces are also important for server-side implementations. A number of vendor-specific representations of delivery context are now in existence. Standardized interfaces can provide common mechanisms that can be used by authors regardless of the particular representation in use. DCCI is an interface that focusses on making properties from the delivery context available to code executing within a client [GLOSS]. Other interfaces focus on making similar information available to code executing within servers [GLOSS]. Some of these server-side interfaces are primarily concerned with static information. This comprises the subset of the delivery context that is common to all instances of a particular device. The W3C Mobile Web Initiative's Device Description Working Group [DDWG] is developing a standardized interface suitable for accessing this kind of information. Other interfaces are more concerned with dynamic and highly dynamic properties. The Open Mobile Alliance [OMA] is working on standardization of this style of interface in the Device Capabilities sub-working group of its Browser Technologies working group [BT DCAP]. One set of interfaces is specifically oriented at providing access to the delivery context directly from markup languages. The Delivery Context: XPath Access Functions [XAF] provides access to the delivery context from XPath expressions, which can be embedded in markup languages. Prior to the work in defining interfaces, previous standardization work concentrated on defining representations of the properties of the delivery context. In particular, W3C's Composite Capability/Preference Profiles [CCPP] provides a framework for representations of delivery context properties. It is based on the Resource Description Framework [RDF]. CC/PP does not itself specify a particular vocabulary and so does not provide a representation of the delivery context. However, it provides the framework on which such representations can be built. By adding a specific vocabulary to CC/PP, the OMA's User Agent Profiles (UAProf) specification [UAPROF] does provide a representation of delivery context. Typically, UAProf tends to be used to represent rather static properties of the delivery context. UAProf profiles are normally associated with a URI. A profile needs to be accessed, parsed and analyzed to allow the information about properties to be retrieved. DCCI defines an interface for accessing delivery context. It does not mandate any specific data model for the delivery context. As such, it can provide a layer of insulation from specific implementations and data models. DCCI does, however, assume that the overall form of the delivery context is a hierarchy. A number of existing delivery context data models are hierarchies. For example, UAProf has a hierarchical arrangement of properties, as does the W3C's Delivery Context Ontology [DCOnt]. DCCI also needs to provide an eventing model, which can be used to report changes dynamically. Situations such as the battery level falling below a certain value or a change in a user preference must be able to cause an event to be triggered, notifying code that has registered an interest in changes in the property. The Document Object Model (DOM) (see for example [DOM]) provides a mechanism suitable for use on web clients that can support hierarchical data models. It also provides an eventing model. DOM implementations are already available in browsers that support scripting. DOM provides the two key features needed by DCCI. By basing DCCI on DOM, and reusing its capabilities, it is also possible to minimize the additional resources that are needed in order to access the delivery context. This is important in the context of small, mobile devices which may have significant limits in the available resources. For these reasons, DCCI is defined as an extension to the DOM. The delivery context is represented as an instance of the DOM. This instance is completely separate from the DOM instance used by the browser to represent the web page that is providing the user experience. They have different root elements. To maximize the range of situations in which DCCI can be used, DCCI implementations may be based either on DOM 2 (see for example [DOM2-Core]) or on DOM 3 (see for example [DOM3-Core]). Some browsers support DOM 2 and some support DOM 3. While there are some differences in the level of DCCI capability that can be achieved with these two versions of DOM, the increased variety of devices that can be accommodated by supporting both is considered worthwhile. DCCI provides a mechanism that allows the type of support available to be determined by code that uses it. One important addition, available when DCCI is based on DOM 3, is that XML Namespaces [XML-Namespaces] can be used. Namespaces allow clear distinction between different properties in the delivery context that might have arisen in different ontologies or that might be provided by different organizations. Because namespaces are not available in DOM 2, there is an increased risk of name collisions. As a consequence, where this specification reserves a name it specifies a prefix of DCCI- to try and help avoid such collisions. DCCI represents delivery context properties as nodes that extend the DOM Elementinterface. The ways in which property values can be accessed and in which notifications can be received, when changes to properties occur, are described later in this document. The way in which the version of DOM being used affects the available capabilities of DCCI is also described. Figure 1. An example of a possible hierarchy of properties that could be accessed via DCCI. Figure 1 illustrates a hierarchy of delivery context properties. 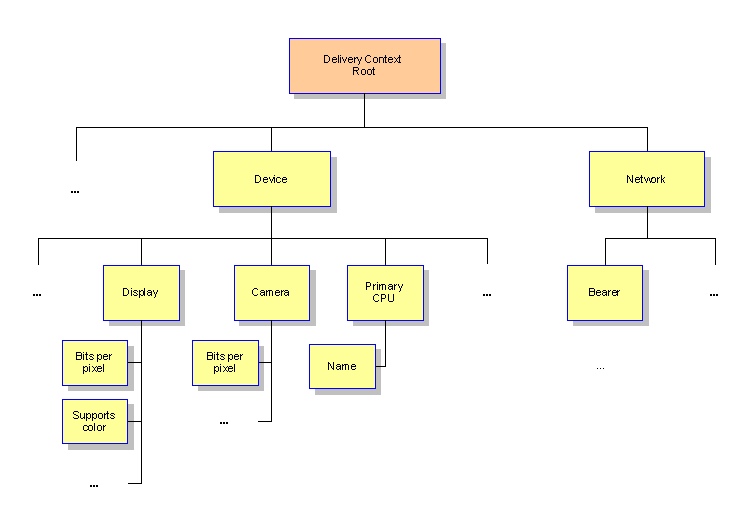 The property labelled Delivery Context Root provides the root of the tree. A number of other properties are shown, some of which are leaves of the tree. In the figure, the ellipses (...) indicate locations where there might be additional sets of properties. The properties shown in Figure 1 are illustrative on the typical kind of information that might appear in ontologies such as [DCOnt]. The leaf nodes in the tree are typically properties whose values are of interest to users of the DCCI. Each property in the delivery context is associated with a given datatype. Individual properties may , for example, be numbers or strings. DCCI supports properties with any of the following DOM datatypes (see [DOM2-Core] and [DOM3-Core]). This type represents values that can be either true or false. This type represents a string as a sequence of 16 bit units encoded in UTF-16. This type represents an object in the scripting language being used to access the interface. This type represents values that can be of any type. Specifically, for implementations based on [DOM2-Core] this is actually a DOMString. For implementations based on [DOM3-Core] it is a DOMObject. Some DOM operations return individual items in the form of a DOM Node. Where such an item represents a property of the delivery context, the Nodewill actually be a DCCIProperty. Some DOM operations return collections of information rather than individual items. When this happens, the collection is in the form of a DOM NodeList. Where such a collection represents a set of delivery context properties, each Node in the NodeList will actually be a DCCIProperty. DCCI provides mechanisms to access properties within the delivery context. It does not provide the means by which properties in the delivery context are managed. Implementations of DCCI must provide those facilities by whatever means is appropriate. Properties may be added and removed from the delivery context at any time in response to events external to DCCI. For example, new properties may appear in the delivery context when a user enables a particular function in their device. Property values may also change at any time, of course. The mechanisms by which implementations of DCCI manage properties and their values within the delivery context is out of scope for this specification. In some contexts, devices may take part in networked interactions with other devices. In such cases, some aspects of the delivery context may represent properties associated with those other devices or on servers that are also part of the network. For example, where a device is connected in some way with a printer via an intervening network, the delivery context might contain properties that indicate the toner or ink levels available in the printer. Where the delivery context includes information that is not directly held on the device on which DCCI is executing, there may be network delays involved in accessing the information. Implementations should ensure that delays in accessing such information do not cause applications using DCCI to block for long periods of time. The mechanisms and network protocols used to distribute and synchronize delivery context properties between devices and other network components are outside the scope of this specification. Some possibilities include SIP Events [SIP], Web Services, and technologies such as Universal Plug and Play [UPnP]. Metadata can be directly or indirectly associated with any property accessed via DCCI. Some potential examples of metadata include the version of a property interface, and timestamps for property creation and modification. Richer metadata could describe ontologies of properties, and be expressed using powerful metadata frameworks like OWL [OWL] for the purposes of authoring solutions. DCCI provides mechanisms for accessing the metadata associated with a property. However, the details of the particular kinds of metadata used and their representation is outside the scope of this specification. The mechanism for accessing property metadata is based on the DCCIMetadataInterface and DCCIMetadataInterfaceType properties associated with each delivery context property. The first of these properties provides access to the metadata-related information while the second defines its datatype. As an example, a DCCI implementation might choose to provide metadata via a URI represented as a DOMString. In this case, DCCIMetadataInterface would hold the URI and DCCIMetadataInterfaceType would indicate that the type was DOMString. As an alternative, the implementation of a particular property could return an interface as the value of DCCIMetadataInterface. Operations on that interface would then yield the metadata. These properties are described fully in 5.1 The DCCIProperty Interface. Values of delivery context properties may change at any time. For example, a user may choose to enable a particular function on the device. Equally, the set of properties in the delivery context may also change. If some optional module, such as a camera, is plugged into a device, a new set of properties may become available. In this example, these new properties might include the number of bits per pixel supported by the camera and whether or not it can capture video. These interfaces not only allow access to delivery context properties at any point in time, they also allow notification when properties change. DCCI supports direct access to the properties in the delivery context through the searchProperty() method in the DCCIProperty interface. This method provides direct access to a specific property when both the namespace and property name are supplied. However, it can also provide access to sets of properties if wild cards are used. For example, suppose that part of the delivery context is the tree shown in Figure 2. Figure 2. 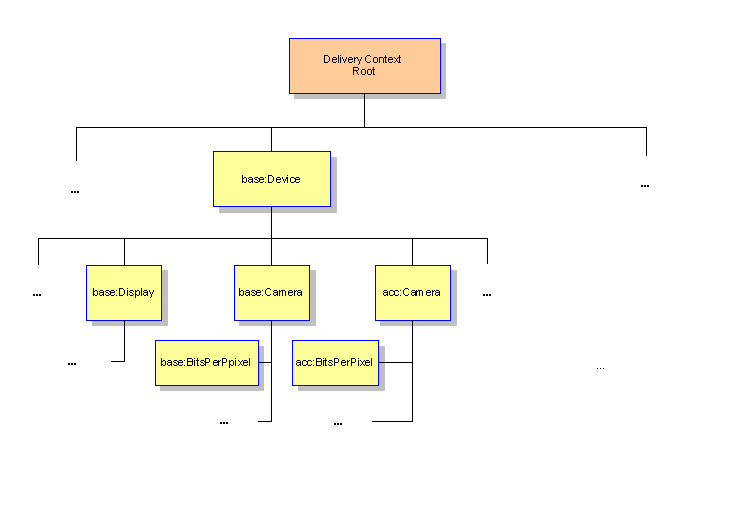 An example property hierarchy. In Figure 2, there are two cameras associated with the device. One is in a namespace represented in the figure by the prefix base. The other is in the namespace represented by the prefix acc. This might represent the situation where a more capable camera module has been plugged in as an accessory to enhance the capabilities of the device. The value of the property BitsPerPixel for the accessory camera could be retrieved by using a query that explicitly references the name BitsPerPixel and the namespace associated with the prefix acc. A query that merely referenced the name and used the wildcard * for the namespace would retrieve a list containing both values. Searching such as this may be valuable when the content of the delivery context is highly dynamic and its structure is not completely predictable. In fact, of course, searches like this might actually retrieve other properties also called BitsPerPixel. Other components of the device, such as any displays that it has, might also have properties with this name. Ontologies of delivery context properties try to address such ambiguity by defining unique property names. Full details of the function available for querying and searching for property values are given in the section on the searchProperty() method in the DCCIProperty interface. DCCI implementations provide events that can be used as notifications that changes have occurred in the delivery context. In addition to the usual DOM events, which can, for example, indicate changes in the structure of the delivery context as properties are added or removed, DCCI adds a new DOM Event, with a value of DCCI-prop-change. This event is raised when a property changes value. DCCI implementers are expected to use the available DOM and DCCI events with appropriate data to indicate such situations. The conditions under which an event is raised may vary. Property change events, in particular, may be generated frequently for rapidly changing properties. For some properties, it may be useful to control the conditions under which notifications are generated, in order to avoid the need to raise and process excessively large numbers of events. Control of the conditions under which events are generated can be exercised, in DCCI, through the values of subproperties of a property or through associated metadata. As an example, consider the case of location updates being generated by the built-in GPS feature in a mobile device. For some applications, it may be necessary for every change in position, reported by the GPS, to be reflected immediately in the delivery context. However, this can result in a very large number of events being raised and processed. For many applications, such as those that add a real time track to a map display, it may be better to report changes only when the device has moved by at least a minimum distance, which could be related to the scale of the map itself. This could bring a very significant reduction in the amount of event processing that has to take place. DCCI does not define any specific properties or metadata to be used for controlling event generation. However, it does provide the basic facilities that can be used to enable this function. Event groups can be used to prevent listeners from stopping an event's propagation before other listeners have a chance to react to it. Event groups may be available in implementations of DCCI that are based on DOM 3. The DOM 3 Events specification [DOM3-Events] notes that if two listeners are registered in two different groups one cannot prevent the other from being triggered. This feature is useful when multiple modules are listening to the same event and some of them need a guarantee that they will receive it, regardless of the actions of other listeners in other groups, which may cause propagation to cease. These particular examples are based on the VoiceXML specification [VoiceXML]. An event listener that wishes to be notified on the overall status of an ASR connection would register for the first category of events. As a result, it would be notified when the ASR engine is connected and when it is disconnected. In addition, it would be notified specifically when the disconnection was due to a hangup. A different listener, that is only interested in notifications on hangup, would register for the last event category in the example. DCCI implementations may provide similar capabilities to group events when based on DOM 3. DCCI provides the means for accessing the delivery context, which includes information such as user preferences, device characteristics and environmental factors. Some of this information could be considered sensitive. As a consequence, a form of access control would be desirable to protect such information. The definition of the details of such access control capabilities is outside the scope of DCCI. However, where an implementation provides access control and an access violation is detected, the exception DCCIException with error code ACCESS_VIOLATION_ERR must be raised. In general, DCCI operations return values that may indicate error conditions. In "exceptional" circumstances, DCCI operations may raise exceptions, for example, when an operation is impossible to perform. This section specifies the DCCI in terms of normative IDL definitions for its properties, interfaces and exceptions. It also defines the behavior of the DOM interfaces associated with DCCI. The Delivery Context Client Interfaces are formally defined in terms of OMG IDL [IDL] interfaces. The DCCIProperty represents an element (property) in the DCCI tree. The DCCIProperty interface inherits from the DOM Element interface. It is required to implement the DOM EventTarget interface. It provides support for creating and manipulating a hierarchy of properties. Unless specifically stated otherwise, the behavior of DCCI is the same as that of DOM. Within the DCCI context, the DOM Node that is returned through the DOM NodeList::item() method call should be interpreted as a DCCIProperty. The DCCIComponent, the Root Property in Figure 1, is itself a property element with an additional read-only attribute for the DCCI version number. For DOM conformance details see section 7 Conformance. Properties raise events to notify changes in property values, or the removal or addition of properties themselves. DCCIProperty supports methods for adding and removing event listeners. The DCCIProperty supports the event capture/bubbling model. This allows an event listener to be added at different levels of the property hierarchy. This is independent of the event propagation model in the host environment. DCCI conforms to the naming conventions for property names and namespaces adopted by XML [XML] and RFC2396 [RFC2396], respectively. In case those conventions are not respected, the standard DOM exceptions must be raised. The DCCIProperty interface makes specific use of the following attributes of DOMElement. The tagName attribute associated with a DCCIPropertymust hold the name of the property. The DCCIProperty interface exposes the following attributes in addition to those of DOMElement. This attribute holds the value of the property. Note that the value attribute does not override the nodeValue attribute that DCCIProperty inherits from Node via Element. The nodeValue property can only hold values of type DOMString, which is insufficient for the needs of DCCIProperty. In a DCCIProperty, the value of nodeValue attribute should be null. Some DCCIProperty nodes may not have a value. Examples include nodes that simply provide containers for sets of other properties. The Display property in Figure 1 might be such a property. In these cases, the value of the value attribute must be null. This read-only attribute describes the type of value that the property contains in its value attribute. Applications can read the valueType attribute to determine the type and the format of a property value present in the value attribute. The values for valueType are dictated by the properties and are defined by property vendors or other bodies. To avoid name clashes, the value of valueType should be a URI. For string values, the value type must contain the string "DOMString". The propertyType attribute denotes the type of property that the DCCIProperty Interface references. The propertyType attribute provides an additional level of granularity to the DCCI interface. This allows the extension of the DCCIProperty interface for a particular type of property. The propertyType attribute is a read-only attribute of type DOMString. For example, a presentation property description can describe additional interfaces for the DCCI presentation property that would be needed to access additional screen specific properties. For example, the DCCIPropertyType for such an interface could be the string "DCCIPresentationType". The propertyType values and corresponding DCCIProperty interface extensions will be specified by other groups/vendors and is outside the scope of the current specification. The default value for the propertyType attribute is the null value. The readOnly attribute is used to determine whether the value and propertyType attributes can be modified. When readOnly is true, any attempt to modify the value and propertyType attributes will result in a DOMException being raised with a NO_MODIFICATION_ALLOWED_ERR error code. When readOnly is set to false the value attribute may be changed. This attribute defines metadata associated with the property. The value of this attribute might be data associated with the metadata, or it might be an interface by which that metadata can be accessed. The related attribute DCCIMetadataInterfaceType defines the type associated with DCCIMetadataInterface. The details of the DCCIMetadataInterface interface depends on its type, which is implementation specific. For example, the DCCIMetadataInterfaceType for a property could be set to "application/rdf+xml", and the value of the DCCIMetadataInterface could be a URI that points to the RDF meta data information available for this property. This interface allows a script author to recognize the MIME type contained within DCCIMetadataInterfaceType, and then fetch and process the RDF meta data at the URI contained in the DCCIMetadataInterface. See 7 Conformance for more implementation details regarding DCCIMetadataInterface. This attribute defines the type of the DCCIMetadataInterface attribute. The DCCIProperty interface exposes the following methods in addition to those of DOMElement. This method is used to determine whether this property has the specified property, as identified by name and namespace URI, amongst its descendants. The search for a property matching the criteria can include all descendents of the property, or can be restricted to its immediate children. The namespaceURI parameter is a DOMString containing the URI of the namespace of the property for which the search is being carried out. If namespaceURI is specified as the string "*" it denotes that properties in any namespace satisfy the search. When deep is set to true, the search applies to all of the descendents of the property. When it is set to false, the search is limited to the property's immediate children. An implementation that supports access control must exclude properties from the search, if the invoker of this method does not have the appropriate access rights. The return value is true if one or more properties match the search criteria. It is false otherwise. This method does not generate any exceptions. This method is used to retrieve one or more properties that are descendents of the property. Properties are retrieved based on the specified name and namespace URI. The search for properties that matching the criteria can include all descendents of the property, or can be restricted to its immediate children. This method also provides a way to filter the resulting list of descendent properties, using an application-defined filter. The dcciPropertyFilter parameter specifies a filter of type DCCIPropertyFilter which can determine whether each node that passes the name/namespace criteria should be included in the final NodeList returned by the method. If this parameter is specified as null, no filter is used. This method returns a NodeList. The NodeList consists of an ordered collection of DCCIPropertynodes. The NodeList has an integer attribute "length" that gives the number of DCCIProperty nodes it contains. If no properties matched the search criteria, the resulting NodeList will have a length attribute value of zero. This method may raise the following exceptions. The DCCIPropertyFilter interface does not expose any attributes. The DCCIPropertyFilter interface exposes the following method. This method is called by the DCCI implementation to check whether a property node can be included within a NodeList. If the return value is true, the node is included, otherwise the node is rejected. The application author provides the implementation for this method. It can contain any appropriate filtering criteria for each Node. Only those properties which satisfy the criteria implemented within the acceptProperty method will be included in the NodeList by the DCCI implementation. This is the DCCIProperty node that will be passed to acceptProperty by the DCCI implementation to check if the node should be accepted to be included within the NodeList. The return value is true if the DCCIProperty passed in in the property parameter is accepted by the filter. It is false otherwise. Properties accepted by the filter will appear, for example, in the output of a call to searchProperty in the DCCIProperty interface. The DCCIComponent interface forms the root node of the DCCI hierarchy. DCCIComponent derives from the DCCIProperty interface and contains an additional read-only attribute called version. The value of the version attribute is the version number of the Delivery Context: Interfaces component. The value of version for this release is the string "1.0". The parent and value attributes of a DCCIComponent have the value null. The DCCIComponent interface adds a single attribute to those from the DCCIProperty interface from which it inherits. In addition, the value attribute of DCCIComponent interfaces must be null. Identifies the version number of the DCCI specification that has been implemented. The version number for this specification is "1.0". This interface does not define any additional methods. This interface does not define any additional exceptions. DCCI defines one specific additional exception, named DCCIException, in addition to those that can defined by the DOM itself. The following error codes can be returned with this exception. This exception is raised if an implementation of DCCI, that supports access control, detects an illegal attempt to access the delivery context. This exception is raised if a call is made to a method which is not supported by DCCI. In particular, a number of standard DOM interface methods are not supported by DCCI. Invocation of these methods must return this error code. This exception is raised if a property filter performs an invalid or illegal operation when filtering a list of nodes returned during a search operation. The DCCI event model conforms to the DOM Event Specification. This includes support for the capture and bubble phases. Modules that implement the DOM EventListener interface, such as a browser or an Interaction Manager [IM], can register as listeners on the DCCI tree. Concurrent with the DOM Event propagation algorithm, when a DOM Event is dispatched on the DCCI property tree, listeners registered for this event type get activated. The listener receives a DOM Event object type that may need to be copied or appropriately cast before it can be processed by that listener (if that listener cannot directly process DOM Events). In addition to using existing DOM events to signal particular occurrences, DCCI also defines one new event. DCCI raises this event to notify a change in the value of a property. This event is a normal DOM Event with its type attribute set to DOMString literal value "DCCI-prop-change". Where an implementation is based on DOM 3, it must mark the event as being within the DCCI namespace. In particular it must set the namespaceURI attribute of the DOM Event to that of the DCCI namespace. DCCI uses existing DOM events (see for example [DOM2-Events]) to notify listeners about particular changes in the structure of the DCCI DOM. In particular DCCI implementations must use the following DOM Mutation events to notify listeners about insertion of items into the DOM and about their removal. This event is raised when a new property has been added to the DCCI DOM. The event is dispatched after the new node has been inserted. The target node of this event is the property being inserted. This event is raised when an existing property is being removed from the DCCI DOM. The event is dispatched before the property is removed from the tree. The target node of this event is the property being removed. This event is raised when the structure of the DCCI DOM changes in any way. Listeners can use it instead of the more specific events concerned with node insertion and removal. Depending on the nature of the change being made, implementations may choose to raise it after a single modification has been made to the DCCI DOM. Alternatively, implementations may choose to raise it only after a set of modifications has been applied. This latter case can accommodate situations in which multiple changes occur in rapid succession. The target of this event is node that is the lowest common parent of the changes which have taken place. This event is raised after any other events caused by those changes have been raised. This section is normative. It gathers together the conformance requirements for implementations of DCCI defined in this specification. A conforming DCCI implementation must implement all the normative sections of this document. A conforming DCCI implementation must implement the DOM EventTarget interface [DOM2-Events]. In a conforming DCCI implementation, the DCCIProperty interface must inherit from the DOM Element interface. Invocation of isSupported() on any DCCI node with the feature parameter set to "DCCI-DOM" and the version set to "2.0" must return true if the implementation of DCCI is based on DOM 2 and false otherwise. Invocation of isSupported() on any DCCI node with the feature parameter set to "DCCI-DOM" and the version set to "3.0" must return true if the implementation of DCCI is based on DOM 3 and false otherwise. In a conforming DCCI implementation, DCCIProperty nodes must return ELEMENT_NODE as the value of their nodeType attribute. In a conforming DCCI implementation, DCCIProperty nodes must return the name of the property as the value of their nodeName attribute. A conforming DCCI implementation must raise the DOM ACCESS_VIOLATION_ERR Exception if it supports access control and detects an access violation. A conforming DCCI implementation must raise the DCCI NOT_SUPPORTED_ERR Exception if an operation is requested that it does not support. A conforming DCCI implementation must raise the DOM NO_MODIFICATION_ALLOWED_ERR Exception if an operation is requested that would result in a disallowed modification of the delivery context. A conforming DCCI implementation must raise the DOM NOT_SUPPORTED_ERR Exception when an attempt is made to insert nodes with types other than DCCIProperty into the DCCI DOM. In particular, this applies if the DCCI implementation also supports the methods insertBefore(), replaceChild(), and appendChild() in the DOMElement interface. In a conforming DCCI implementation, DCCIProperty nodes may return null for the value of the ownerDocument attribute. A conforming DCCI implementation must implement DCCIMetaDataInterface as a DOMString unless the implementation is based on DOM 3, in which case it must be implemented as a DOMObject. A conforming DCCI implementation may implement cloning, adopting and importing of nodes. However, it must raise a DOM NOT_SUPPORTED_ERR Exception for any operation of these operations that is not supported. A conforming DCCI implementation should raise the most appropriate DOM Exception when it encounters an error not otherwise stipulated explicitly in this specification. A conforming DCCI implementation may provide access to the root of the delivery context through a global variable. If this mechanism is chosen, the preferred name for the variable is DCCIRoot. DCCI implementations must use the DOM Mutation events DOMNodeInserted, DOMNodeRemoved and DOMSubtreeModified to notify listeners about changes in the structure of the delivery context. The DCCI namespace URI is http://www.w3.org/2007/dcci. In addition to the conformance requirements for all DCCI implementations, additional requirements apply to those implementations based on DOM 3. A conforming DCCI implementation based on DOM 3 may support the use of the DOMImplementationRegistry to enable the DCCI DOMImplementation to be discovered. If this approach is used, the implementation must be identified by the DOMString literal value "DCCI 1.0". Additionally, if this approach is used, the implementation must provide access to the root of the delivery context using the getFeature() method of the DOMImplementation interface with the feature parameter set to the DOMString literal value "DCCI-Root" and the version set to the DOMString literal value "1.0". A conforming DCCI implementation based on DOM 3 must support all the datatypes supported by the W3C DOM 3 specification [DOM3-Core]. In a conforming DCCI implementation based on DOM 3 DCCIProperty nodes must return the value of their textContent attribute as null. A conforming DCCI implementation based on DOM 3 must implement DCCIMetaDataInterface as a DOMObject. A conforming DCCI implementation based on DOM 3 may implement the event interfaces described in the [DOM3-Events]. Note that [DOM3-Events] adds the notions of event namespace, groups and categories to [DOM2-Events]. These may be useful features in the context of DCCI. A conforming DCCI implementation based on DOM 3 must support the use of namespaces in events to distinguish between DCCI events raised by different properties. This allows events that have the same name but which were defined by defined by different organizations to be distinguished. They also allow code to listen for property events only from a particular organization. This section is normative. It describes an ECMAScript [ECMAScript] language binding for DCCI. This property is of type String for DOM2, or Object otherwise. This read-only property is of type String for DOM2, or Object otherwise. This function returns a NodeList. The propertyName parameter is a String. The dcciPropertyFilter parameter is a DCCIPropertyFilter. The deep parameter is a Boolean. Objects that implement the DCCIComponent interface have all properties and functions of the DCCIProperty interface as well as the property defined below. This is an ECMAScript function reference. The method takes in a DCCIProperty object as parameter and returns a boolean value. This appendix contains the complete OMG IDL [IDL] definitions for DCCI, with the exception of existing DOM modules for the DOM core and DOM events, which are used for some common DOM data types and the EventTarget interface. This section is informative. It provides an illustration of how the DCCI could operate. This example demonstrates how events can be used. In this example location events are provided whenever the device has moved a certain distance. The location may be determined by GPS, or via a location based service. Three DCCI properties are used in this example: location, updateDistance and format. The location property contains the current location in the form specified by the format property. The updateDistance property is used by the implementation to determine when to trigger the update event. This reduces the number of events being triggered, as postal codes are often quite large and as such it would be inefficient to have more frequent events triggered. This is an example of how conditional events can be implemented via an additional property. specified to be the postal code for the device's GPS location. the application and might be based on a Web Service. events raised whenever the location property is updated. is used to prevent execution when document is first loaded. This section describes the changes introduced in this version of the specification. In the introduction, "programing" has been replaced by "programming"
Mark Watson, Volantis Systems Ltd.